Claudia Burns, PT, DPT is a licensed Physical Therapist who has been practicing in Maine since 2014. 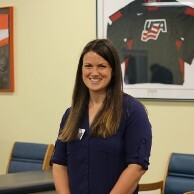 She received her Bachelor of Science degree in Kinesiology from Indiana University in 2010 and her Doctor of Physical Therapy from the University of New England in 2014. Claudia has spent her career diagnosing and treating a variety of musculoskeletal disorders with an emphasis on non-specific chronic low back pain and cervical dysfunction. She has attended many Maitland-Australian Physiotherapy seminars to refine manual therapy techniques. She is also certified in Functional Dry Needling and the Selective Functional Movement Assessment and focuses on identifying and addressing faulty movement patterns to restore quality, pain-free movement. Claudia joined the Coastal Ortho team in 2018.